Elisa’s “I’m professional and political,” is precise and pitch-perfect. 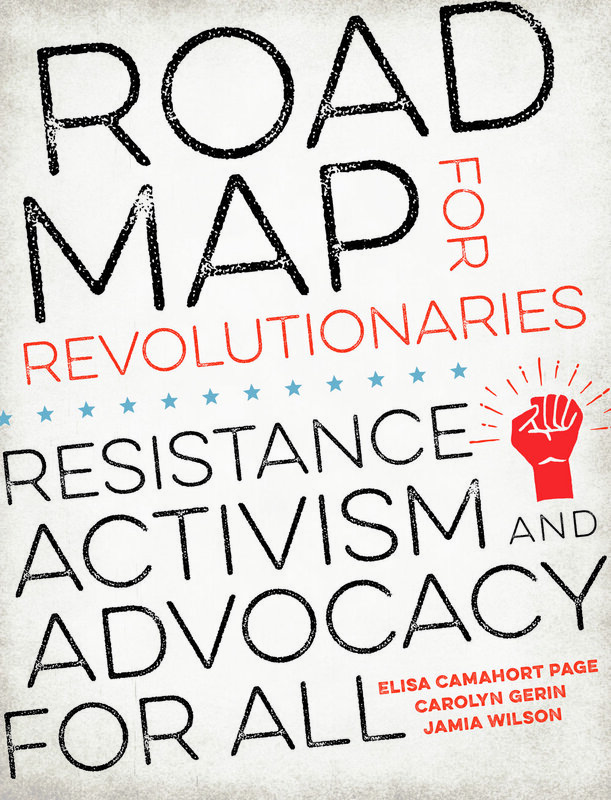 On the political side is Roadmap for Revolutionaries: Resistance, Activism, and Advocacy for All, slated for publication September 18th (you can pre-order it on Amazon now) and co-written by Elisa, Carolyn Gerin, and Jamia Wilson. It features a prominent blurb by Gloria Steinem. And Elisa’s professional journey features ever-present themes of empowerment through the written word, living one’s values, and making a difference in one’s community. It’s also not surprising to hear a Ladybadass use “and” to define her career. Elisa describes herself as a writer and a strategic advisor. She helps people and organizations understand the value of their stories and how to complete their narrative. She also helps individuals effect change on a personal, community, or national level, often by providing them with publishing or writing resources and communications coaching. Elisa, after majoring in theater at San Jose State University and moving to New York to work as a creative artist, found she missed the San Francisco Bay Area. She also felt the need for a job that guaranteed a consistent paycheck. Through a family friend she found a job in the commodities industry, where she worked for next seven years. The dot-com boom began around the time she realized a career in commodities would limit her ability to stay in the Bay Area and have any real job mobility or advancement. In the late 90s Elisa began working as an administrative assistant in the marketing department of a technology company to see if she had the aptitude for it. She describes her experiences at two different companies during the dot-com boom and bust as empowering and disempowering. Common experiences involving sexism and ageism (Elisa points out that ageism can often apply to the time one spends in a particular position versus the age of an executive) resulted in limited advancement opportunities. She is direct about sexism and her preferred style of working. Elisa’s career choices are a LadyBadassery jackpot. Each is a clear example of one or more of the LadyBadass credo: BE BRAVE, BE CURIOUS, BE KIND, BE YOU. When asked about how she got to where she is today, Elisa says, “It's actually a story,” with emphasis on the last word. Toward the end of her role at a second tech company the dot-com bust was in full slump. Her skill at saving (she had a year’s take-home pay in the bank) meant she felt safe leaving her job without having a new one. She didn’t have much of a plan, she just knew that she didn’t want to be at that company anymore. Elisa had started blogging for fun. After an aha! moment, realizing the business potential of blogging, she began helping companies extend their reach and customer relationships through blogs. Elisa never intended to be a consultant or an entrepreneur. She was both when she met Jory Des Jardins and Lisa Stone, with whom she founded BlogHer, Inc. The co-founders raised $20 million over four funding rounds and turned BlogHer into an online media company with a conference franchise for women. In its final five years as a standalone company (BlogHer was acquired by SheKnows Media in 2014) the women writers on the BlogHer platform collectively made $36 million dollars. She describes the revenue generated by BlogHer simply, with significance. Elisa hears accounts like these often and you can tell each one is important to her. Her co-creation, a platform that helped women successfully discover and act upon their passion and share their knowledge, enabled her to build considerable expertise in the publishing arena. It drove home how the written word can empower people to find and act in ways that propagate their values and change they want to see in the world. Elisa stayed on at BlogHer after its acquisition for more than two years—longer than most founders. She consulted with the New York-based team from her home office in the Bay Area. It would have been easy for her to stay and focus on a few primary work tasks while also writing a book. But transitioning from a founder of a standalone company to a high-powered executive at a larger media organization isn’t easy. The book that Elisa began working on in 2017 was different from the book she had intended to write. She thought she was going to write a book encapsulating the lessons learned building BlogHer. But the day after the 2016 Presidential election one of Elisa’s friends, Carolyn Gerin, reached out. Carolyn was an author and fellow Bay Area entrepreneur, and during that post-election messaging exchange Carolyn helped determine Elisa’s next ‘and,’ when she described a dream. Elisa suggested they invite a third co-author to round out the author team’s perspective and experience. Jamia Wilson famed author of Young, Gifted, and Black and contributor to Together We Rise: Behind the Scenes at the Protest Heard Around the World and Babe completed the triumvirate. Elisa credits her dot-com money savings with her ability to go two years without a paycheck when starting BlogHer. Being able to leave SheKnows Media to write a book was also partially due to another source of support: her partner. She recalls her partner’s perspective as a combination of wise words and practical support. The realization she could rely on her partner to make up the living expenses was freeing. With support, Elisa began her next adventure. It takes more than a wonderful personal partner’s emotional and financial support to help turn a dream into reality. Early in Elisa’s career, she benefited from mentors at the technology companies where she worked. Later on, she was exposed to more mentors and became one herself. Elisa really likes the concept of “thin slices” and applies it to mentoring. She doesn’t believe in the concept of a single, benevolent mentor who is the only person you look to for complete support. When asked about the future of work, life, and empowerment the phrase that she says comes to mind is you in danger, girl. She mourns the dearth of stock options available to workers today and sees the gig economy as one of mostly unfulfilled promise for workers. Elisa uses and loves a few apps for the convenience they offer but wonders at the limited vision of technology today. Given our societal expectation that everybody be reachable 24/7, Elisa believes that it is crucial that everything we do, including our work, is aligned with our core values. “Our jobs ask so much of us. We're expected to be available 24/7. I'm not saying I like that phenomenon but it is a phenomenon. Elisa is passionate about politics and civic involvement. Her research and experience running BlogHer allowed her to have conversations with many influential voices. Giving people a voice and the ability to act upon those ideas is the basis for her book, Road Map for Revolutionaries. With her co-authors, in workbook format, Elisa guides the reader through terms to familiarize themselves with, a guide to hit the ground running, a resources section, and how to out find more. It’s designed to make it easy for people to take action. Road Map for Revolutionaries comes out right before midterms (and fewer than 3 months after President Barack Obama’s strongest public comments to date about getting involved, with a special emphasis on women). Available just as the nation is collectively in a back-to-school mindset, Road Map, a textbook-like guide about how to effect change on a local, regional, or national level, is likely to be a smash success. Is she just amazing? We at Ladybadass are eager to read her book and get involved. Order your copy of Road Map for Revolutionaries now!